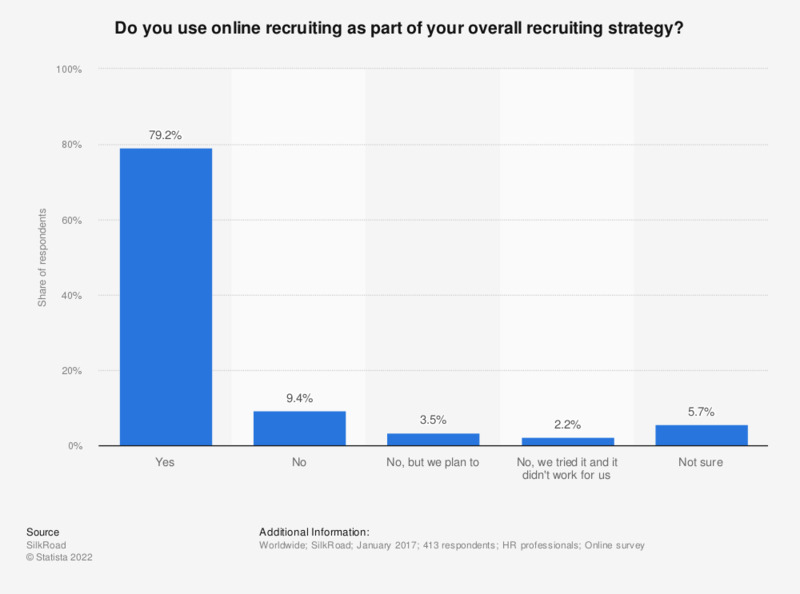 Do you use online recruiting as part of your overall recruiting strategy? This statistic shows the share of human resources (HR) practitioners by usage of online recruiting for recruiting as of January 2017. During the survey, 79.2 percent of the respondents stated that they use online recruiting as part of their overall recruiting strategy. Which type of employees do you typically have the most success finding via online recruiting? What are the biggest cons of online recruiting? Which of the following does your recruiting or jobs website page feature? Which of the recruiting methods have been replaced with online recruiting? What are the biggest pros of online recruiting? Typically, does online recruiting bring you candidates faster? Is your organization willing to negotiate benefits? Which quality of hire metrics do you use?